Lock in a great price for Sedartis Swiss Quality Hotel – rated 8.7 by recent guests! Location - near to the train station, near to the main shopping street in Thalwil, wonderful roof terrace with view of the lake. Excellent restaurant for dinner and breakfast. Great location, great view, comfortable rooms and especially the bed. Friendly staff always willing to help (eg late checkout at short notice was brilliant). Great breakfast and lovely lunch venue too. The staff were extremely helpful on arrival and as a family it was great having two adjoining rooms as it gave us the space we needed to enjoy our stay. As it was very warm, we requested fans and to our pleasant surprise the staff provided us with two Dyson Fans!!! Brilliant. Staff were very friendly, the rooms were good and location was very convenient as it was opposite the train station and a five minute walk to the Ferry Terminal. A beautifully placed hotel between the railway station and the lake with some great views. It is modern, well appointed, comfortable and has very helpful and friendly staff. This is our second visit and I am sure we will stay again. Good location next to train station and bus. Modern room with nice outfit. Very comfortable. Staff was friendly. Family room was two rooms with adjoining interior doors, which worked well for our situation, but wasn't anything unique for a family. Location next to Thalwil train station was perfect, and town of Thalwil had plenty of food/shopping options as needed. Sedartis Swiss Quality Hotel This rating is a reflection of how the property compares to the industry standard when it comes to price, facilities and services available. It's based on a self-evaluation by the property. Use this rating to help choose your stay! Located in Thalwil’s center, Hotel Sedartis offers rooms with a balcony or a terrace and free Wi-Fi. There is a terrace with a view of Lake Zurich, a massage salon and a golf simulator. The bright rooms are equipped with a mini-bar, TV set and electronic safe. All rooms are nonsmoking. At the restaurant, guests can enjoy a selection of international dishes, and they can visit Edo Smoker's Lounge for a drink and a snack. A rich buffet breakfast is served daily and on Saturdays and Sundays it can be enjoyed until 11:00. During the summer season, the breakfast buffet includes a variate of Arabic delicacies. Guests can access the spa and beauty facilities of a partner hotel free of charge. It is located in Rüschlikon, a 3-minute drive away. The hotel is located opposite Thalwil’s main station and the train journey to Zurich takes 10 minutes. The pier is also close to the hotel and the airport is a 30-minute drive away. This property also has one of the top-rated locations in Thalwil! Guests are happier about it compared to other properties in the area. This property is also rated for the best value in Thalwil! Guests are getting more for their money when compared to other properties in this city. When would you like to stay at Sedartis Swiss Quality Hotel? This unit consists of 2 rooms with connecting doors. The terrace can be accessed from both rooms and each features a work desk, a TV and free WiFi. There are 4 single beds and 2 extra beds. in the room. Another extra bed is available upon request and availability against a surcharge. Private parking is available on site (reservation is not needed) and costs CHF 15 per day. These stylish rooms come with a spacious seating area, a furnished terrace overlooking the village, a flat-screen cable TV and a bathroom with a hairdryer, a shower and toiletries. Additionally, it provides a Nespresso coffee machine, free soft drinks in the mini-bar and a working area. Guests can take advantage of free entrance to the wellness area. This room has a double bed and an extra bed. These rooms overlook the village and the train station and come with a work desk, a wooden floor, a bathroom with a shower, a hairdryer and toiletries, and a flat-screen TV. In addition, they feature a mini-bar, as well. These rooms overlook the village and the railway station and come with a work area, wooden floors, a bathroom with a shower, a hairdryer and toiletries, and a flat-screen TV. In addition, it features a mini-bar. These rooms come with a balcony or terrace, a spacious work space, a flat-screen TV and a bathroom with a hairdryer and toiletries. A mini-bar is available, as well. This room has 2 single beds and an extra bed. These rooms come with a large work space, a balcony, offering views of Lake Zurich, a flat-screen TV with cable channels, wooden floors and a bathroom with a hairdryer and toiletries. In addition, a mini-bar is available, as well. Guests can take advantage of free access to the wellness area. Hotel Sedartis - good things are so close. The seminar and meeting hotel is only 9 minutes away from downtown Zurich and has direct connections to Zurich Airport. 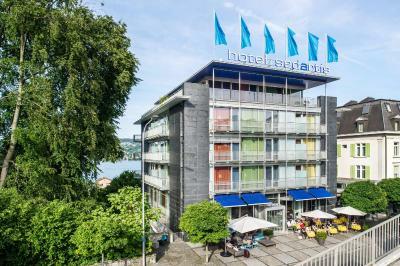 The Sedartis is a 4* hotel close to Lake Zurich with design character. The restaurant and the Edo Bar / Lounge are the culinary venues in the hotel, where traditional local dishes and snacks are offered. An indoor golf facility, the nearby Lake Zurich as well as the Belvoir Wellness, Gym & Beauty at the partner hotel are available for recreational activities. The Sedartis team would be delighted to welcome you in Thalwil, where you can experience the friendly hospitality and enjoy the fantastic view of Lake Zurich. House Rules Sedartis Swiss Quality Hotel takes special requests – add in the next step! All older children or adults are charged CHF 60 per person per night for extra beds. Sedartis Swiss Quality Hotel accepts these cards and reserves the right to temporarily hold an amount prior to arrival. The price is reasonable for Switzerland but Swiss prices are a little on the high side. So no really a negative of the great hotel, just general comment on Swiss pricing. Staff were not overly friendly or willing to speak English. Staff very friendly, very modern. The most uncomfortable stay I’ve had traveling to Switzerland. Barely slept. The mattress is awful and the pillows are so flat you could just as well be sleeping right on the mattress. Would not go back there.